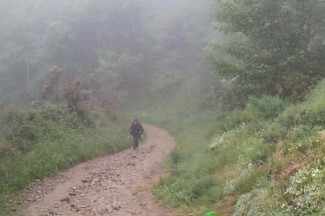 Walking along the Camino in the morning fog. At my parent’s house, on the wall near the kitchen table, sits a plaque I bought for them years ago that states, “Home is where your story begins.” Back when I first saw that plaque, I had just started writing — and wrote mostly stories about my family. If home is indeed where your story began, this was the only home I would ever have. From that home, however, I have taken journeys to and fro, including my pilgrimage. And the two pieces of art that sat before me caused my heart to flood with all those memories. On Saturday, I walked into the gallery seeking the peace of “The Pilgrimage” — that boat, that church, the path. But it was gone. I stared at the empty space where it had been. Saw “The Journey Home” beside it, but “The Pilgrimage” was not there. It was then that I realized “The Pilgrimage” was my favorite of the two. I looked at “The Journey Home” and it just didn’t give me the solace I was seeking. The house was similar to ones I’d seen when in France — it looked nothing like the one I grew up in. But the church depicted in “The Pilgrimage” looked just like some I’d seen on my Camino. The dirt path looked like many of the paths I’d walked. My camino experience is only a year old — still new — and I feared I was losing the memories and meaning of it. And now the piece that brought those memories back was gone, too. I was a little sad, but figured someone else was giving it a good home. Then I heard two of the artists talking about wrapping pieces to take to another show. One was Holden McCurry, the artist of both pieces. “Did you sell ‘The Pilgrimage’? Or take it for a show or something?” I asked, hoping for the latter. “Oh, no. It’s here — it’s outside under the tent.” For the festival, they’d set up a tent on the street outside the gallery to draw people in. I let out a sigh of relief. Coming down the sidewalk instead of the street, I’d completely missed the tent. “Actually, maybe I’ll bring it back in now.” He brought it in and placed it back in its spot. I went over to look at it and wondered if I should buy it so as to never be without it. Memories live in our minds; physical objects remind us of them. Have you sought solace from something or someone only to have it or them disappear from your life? Do memories fade without physical objects or beings to remind us of them?